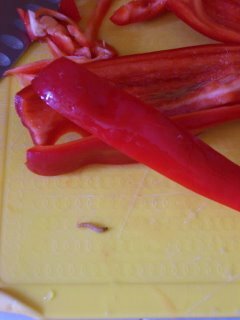 As I cut into a gorgeous red pepper today, I came accross a little worm. At first I jumped back, and thought "gross" and then I had a second thought...why is this worm in my pepper? I had bought the pepper at a local farmers outdoor market...for those of you cityfolk let me explain what that is; local - grown in or near Castellon, farmers - spanish men and women in coveralls tilling their small plots of land, outdoor market - many tarp covered areas with worn out tables and randomly displayed fruits, vegetables and herbs. This market is not airconditioned, there are no metal carts, no loud speakers blaring "special on Jif Peanut Butter" or "clean up on aisle 5". This place would be called "dirty" by some and the produce "unhealthy" by others. Why? Well organic produce is ugly and dirty, it hasn't been sprayed with pesticides, genetically modified, waxed, polished, buffed and transported across countries and even continents. the mushrooms are not sliced and in a stryofoam container wrapped in plastic, they still have their long dirt covered stems as if they were plucked from mother earth that very day. I reminised about how I used to shuck corn in my small town in Kansas and would find worms in the corn, I did not give it a second thought back then. I would just give that ear of corn to my mom to finish peeling or I would put it back in the bucket for someone else to finish...worms were "gross" to me back then also. 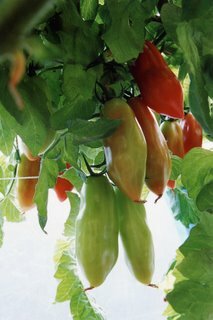 As I grew older, worms disappeared from my food Why? well, super-huge corporate farms have replaced the "local farmer" and millions of tons of pesticides/dangerous toxic chemicals are sprayed on the produce which is eaten by unaware consumers. I looked at my little wiggling gusano (worm in spanish) and marveled how "Gus" had managed to live in my pepper in my refrigerator for over a week. I thought that maybe he was really tired of peppers and would like some other vegetable, so he is now living in the trash dumpster with part of his pepper home, some cucumber peelings, tomato tops and some olive pits. I think Gus will be happy there and maybe meet other pesticide free gusanos. I wish I could bring him to Kansas to live on my sisters farm, I do believe he would be in heaven in her garden! I shared the elevator with one of our neighbors here in NYC one day. She noticed my bag of newly purchased organic veggies and said that she had tried going organic awhile ago, but then stopped after seeing a bug in her broccoli. So I asked her, "You mean, you would rather eat pesticides than find a worm?" She suddenly got glassy eyed, like she was trying to think about her choice from this new approach. She had just begun to open her mouth and say something when the elevator door opened. She snapped out of it and walked out with a friendly "OK, see you later!" Thanks for the story John. Maybe she will take your question to heart...and then again maybe she won't. Being an optimist, I will asume that she will realize that a little worm is much better than pesticides and will go back to buying organic!